For detailled information how to get to the campus by any means of transport please click here. 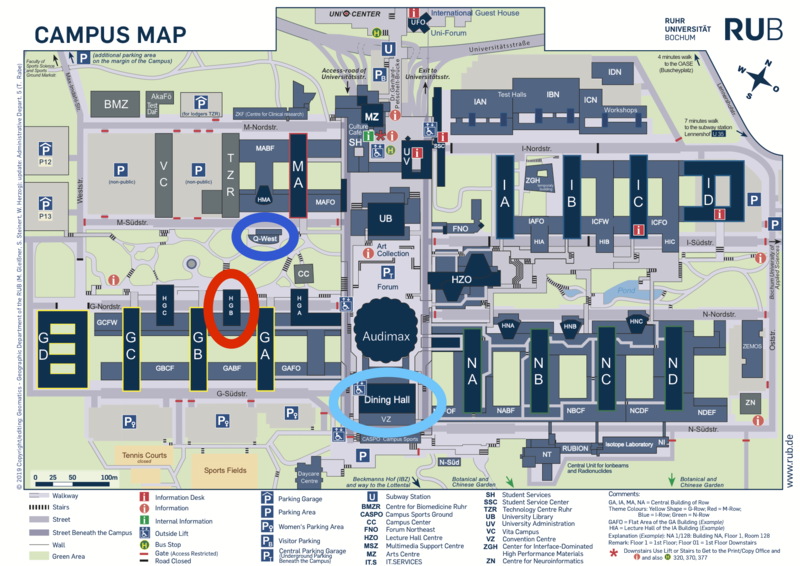 All lectures and talks will take place in the lecture room HGB 50, circled in red on the map below. We recommand the Mensa, called Dinning hall and circled in light blue on the map. You can pay there with cash, except at the couple of cashiers where there is a big sign indicating you need a special card to pay. Menu and prices of the Mensa. You find also the Bistro in the same building as the mensa (circled in light blue). You can pay in cash. Menu and prices of the Bistro. You can also consider going to the Q-West, circled in dark blue on the map. It is very close to the lecture room. The menu is of slightly higher quality but also a bit more expensive and the payment is more complicate. You need to buy a Q-Card and charge it with money in order to pay. You can buy and charge this card at the Q-West. You can also get the money back of this card at the Q-West when you don't need it anymore. In the evening, you can have dinner there and pay with cash. More information about the Q-West (in German).